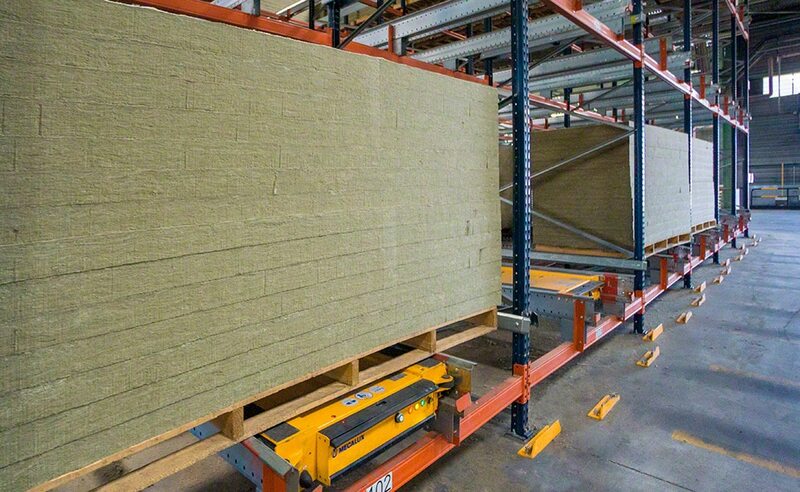 Rockwool Peninsular needed to store over-sized product on 1,000 x 2,400 mm pallets. To do so, Mecalux equipped the warehouse the company owns in Caparroso (Navarra, Spain) with compact pallet racks that have wider than usual channels for the motorised Pallet Shuttle. This solution means the installation’s space is optimised and the handling of goods is quicker. Rockwool Peninsular is the Spanish subsidiary of the Rockwool business group, created in Denmark in 1937. Since then, it has kept growing due to its main product: rockwool. Different kinds of structural insulation are manufactured out of this material: thermal ones to protect against cold or heat, and those for acoustic or fire protection. In the last few years, the company has experienced huge business growth, expanding operations to more than 30 countries. Rockwool found itself in a position where it needed to store bulky product. As the solution to this challenge, Mecalux installed a block of high-density pallet racks that use the Pallet Shuttle system and that provides a 336 pallet capacity. This 312 m² block is filled with 7 m high racks and 21, 2.5 m wide channels. Each channel can deep store 16 pallets. The Pallet Shuttle system operates by compacting what is stored, optimising the available space and making it possible to house a large number of pallets in a limited space. This solution is a perfect fit for Rockwool’s goods: a few SKUs with a high turnover. The operator does not drive the forklift into the aisles, which streamlines loading and unloading processes. To insert the goods, the operator places the motorised shuttle in the channel with a forklift. Next, the Pallet Shuttle moves the load to the first open space where it deposits the load and returns to its home position. The extraction process runs the same way, but in reverse. The Pallet Shuttle receives the operator’s commands sent from a Wi-Fi connected tablet. A user-friendly software provides the operator with a variety of information. Different operations can be carried out from the tablet: select how many pallet to extract, take inventory, manage authorised users, etc. Full use of space: the compact pallet racks optimise Rockwool’s available space, providing a storage capacity of 336 pallets that are 1,000 x 2,400 mm in size. Adapted to the customer’s product: the 2.6 m wide channels comprising the racks accommodate very bulky product. Loading and unloading efficiency: the motorised shuttles, directed by a highly-functional tablet, operate automatically, decreasing the margin of error and improving safety.